I have been working on a project with Lynn Hershman, called Alchemists Wand for the 21st Century. 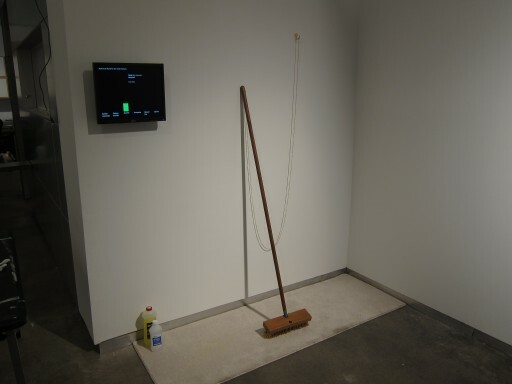 This art piece incorporates a number of brooms that have been modified to detect toxic substances, registering this on LEDs embedded in the broom handle, and transmitting their readings to a screen that presents information on what to do. Each broom detects a different substance, currently: alcohol, ammonia, carbon dioxide, carbon monoxide, natural gas and various solvents. The piece showed at Bitforms gallery in New York, as part of a show called “Touch: A Space of Relations”. 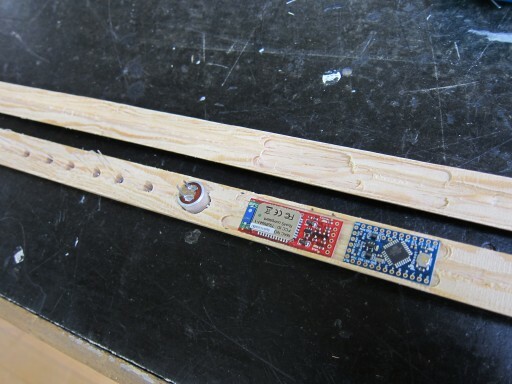 The first challenge was to find sensors that could detect a number of substances, cheaply and reliably. At first, I looked at some fancy MEMS sensors that could pick up multiple substances at once, but this seemed unfeasibly bulky and expensive. Jonathan Foote, a colleague at Noisebridge, pointed me to this collection of gas sensors, that seem to be able to do the job cheaply. They seem to be very similar to the sensors from Figaro sensors, and in fact are pin compatible. I built a test rig, that included an Arduino microcontroller, a sensor, LED indicators and later, a data radio. The test rig proved that the sensors were in fact very accurate and fast, and that batteries could power it for a reasonably long time. It also made it possible to move ahead with the developing the software for the device. I also realized that many of the online case studies of people who claimed to have used the sensors were wrong: they described circuits that really could not work. 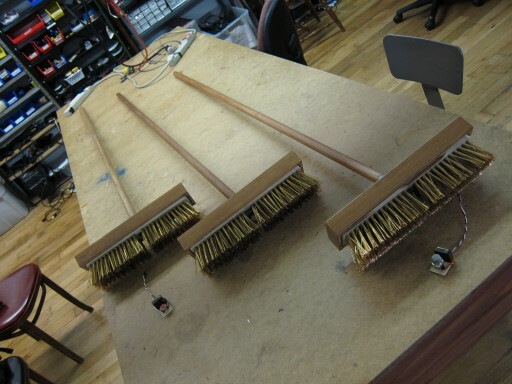 However, the most challenging part of the project was just beginning: getting all the electronics into the broom. Initially, I proposed either thickening the broom handle, or adding a pod to contain the electronics. This would give the project a sort of steampunk industrial aesthetic. However, this did not fly, Lynn really wanted it to look like a broom. 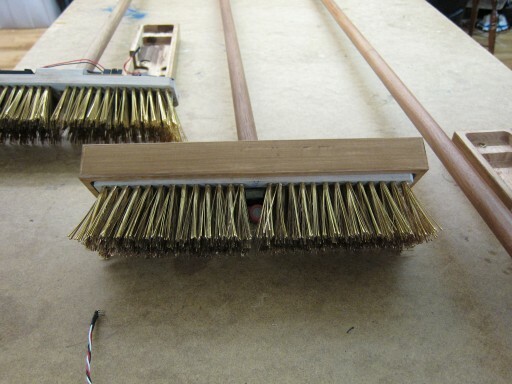 My first attempt at integrating the electronics was with a regular push broom. The plan would be to incorporate the electronics into the handle, with the sensor and batteries in the hollowed out head. The only radio which would fit easily was a Bluetooth radio, so I started working with a Bluesmirf transceiver. After considerable effort, I was able to fit the Arduino Pro Mini, the Bluetooth transmitter, the LEDs and a small buzzer into the broom handle. I built a jig that allowed me to slice it in half lengthwise, and then used a router to carve out hollows for the components. However, this was taking a long time – and it was not clear that the sensor would work well embedded into the broom head. Fortunately, Lynn proposed moving back to original idea of a square janitor’s broom, and enlarging the head with a box that would surround it. This provided ample space for the electronics and batteries. Working with a skilled woodworker, a second prototype established the feasibility of housing everything in the broom head, and a new approach for embedding LEDs in the handle. 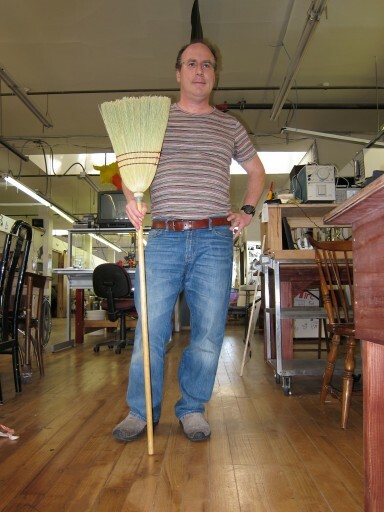 We were also able to test a finish for the broom, covering it entirely in gold leaf. This was not quite what Lynn wanted, so for the final iteration we instead used a broom with metal bristles, electroplated first with copper and then gold. 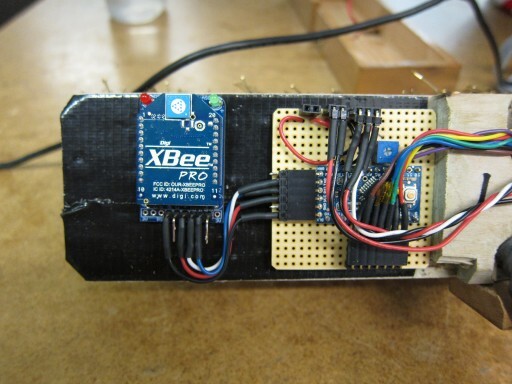 The final design of the electronics uses an Arduino Pro Mini and an XBee radio. 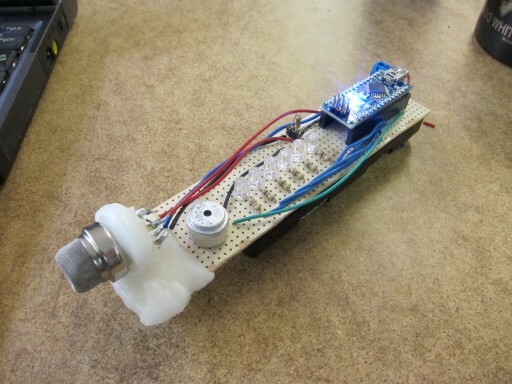 The sensor is mounted in a module that incorporates a tiny fan, that draws air past the sensing element. Power is provided by 4 AAA batteries. I would have liked to have used AA batteries, for longer battery life, but space was very tight. I spent a lot of time fabricating custom connectors and cables to fit the very compact space. The brooms are also designed for easy maintenance: the sensors, LEDs and batteries are designed to unplug easily from the main board. The picture above shows three of the brooms, almost finished. The sensor module is the little thing with the tail. Note the gilded bristles! Below, a close-up of the broom head with the sensor nestled amongst the bristles. The software that drives the screen display was written in Processing (Java), and relies on another XBee module connected to the hosting computer. I designed a simple and very reliable protocol for connecting the brooms to the display computer, they will automatically connect when powered on. I am pleased with how the project works artistically. It takes a mundane object, and makes it magical. 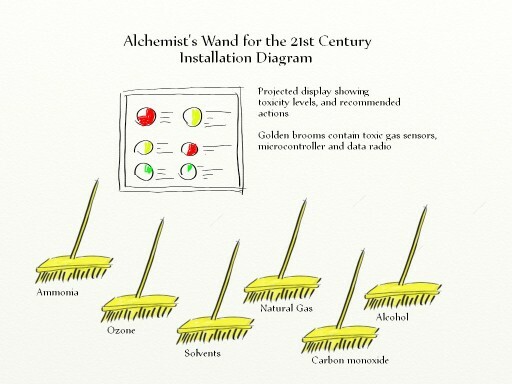 The brooms react quickly and with great precision to invisible substances, and transmit their results to a remote screen with no apparent connection. The magical nature of the brooms is indicated with great subtlety: violet LEDs discretely embedded in the handle, and golden bristles. Lynn’s artistic guidance was essential to achieving this “magic”, her insistence on subtlety is what makes the project an artwork and not a demo. I am very pleased to have worked with Lynn from conceptualization to realization. This was a technically challenging project, and I think it turned out well. I really appreciate the working relationship with Lynn: her insistence on certain key points, such as the appearance of the brooms, made this a much more “magical” project, making it more of an artwork than a technology demonstration.